AD – This post contains gifted products, and I was paid to post on Instagram. However, I didn’t agree to blog in any way – I’ve just chosen to because I truly love this product! Back when I was younger I used to love doing my nails. This post from 2013 shows just a fraction of my beloved Barry M nail polish obsession. I would really love a bit of self-care and nail painting every weekend, but slowly I gave up. The waiting around hours for the polish to fully dry, and chipping after one or two days made it feel like wasted time and effort. Gel nails became mainstream maybe 5 years ago, and just 2 or 3 years ago we were able to do our own gel manicures at home. I’ve had gel nails done a few times before – always at a salon, and only when I had a special occasion. Costing around £30 for file, shape and colour, it’s not something I can afford to do every few weeks. 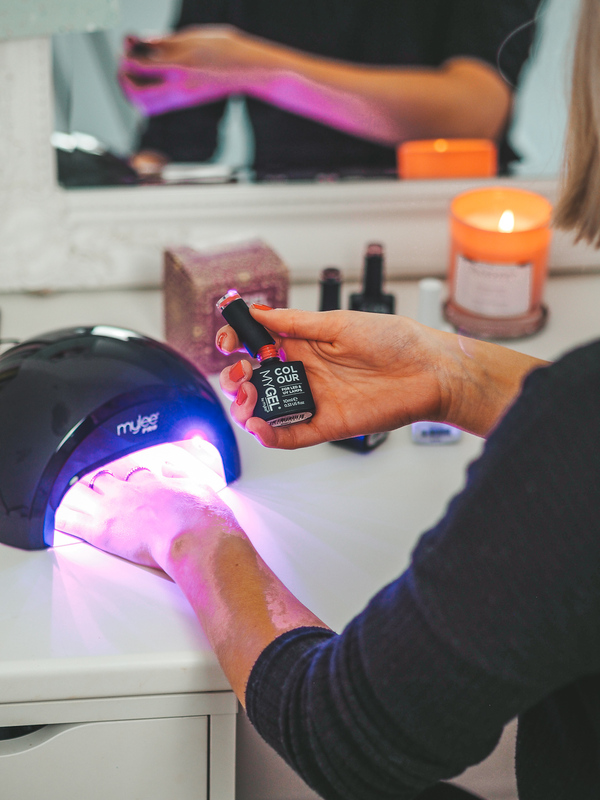 But when I was offered a UV Gel Nail kit from Just Beauty, I was keen to finally be able to give myself a gel manicure at home, for free! The kit came with a UV lamp, a gel top coat, a gel base coat, 4 gel colours, a bottle of gel prep and wipe and some gel remover too. The perfect starter kit! I’ve been using the Mylee gel kit for a few weeks now, and slowly but surely I’m getting better at it. The beauty of getting gel nails done at a salon is that it’s done by professionals with a steady hand – something I don’t have! But the results I’m getting is far better than paying for professional nails every few weeks. To start, you file and push back your cuticles, as with any normal manicure. Once your nails are prepped, wipe some of the prep and wipe over them, and apply a thin layer of your base coat. With every layer of polish you apply, you place them under the UV lamp for 30 seconds – which is handily on a timer. 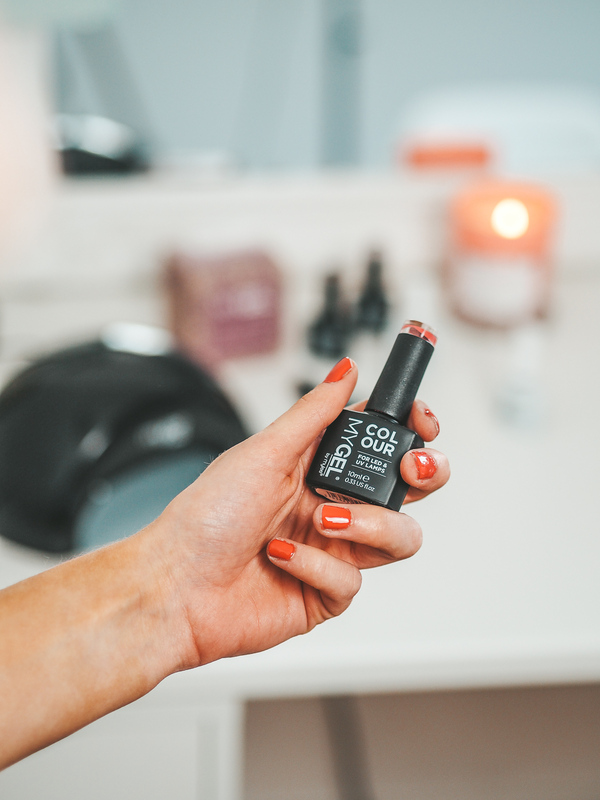 Around 2 coats of your colour should give you an opaque finish. The key is when you’re applying to keep away from the skin. If you paint the skin around your nails by accident, it’s likely your gels will peel away from the nail a lot more easily and end up peeling off completely. After you’ve applied all your gel layers, including a top coat, all that’s needed is another wipe of the prep and prime, and your nails will be done! You’re left with a beautiful glossy set, which will last 2-3 weeks.. depending on your application. 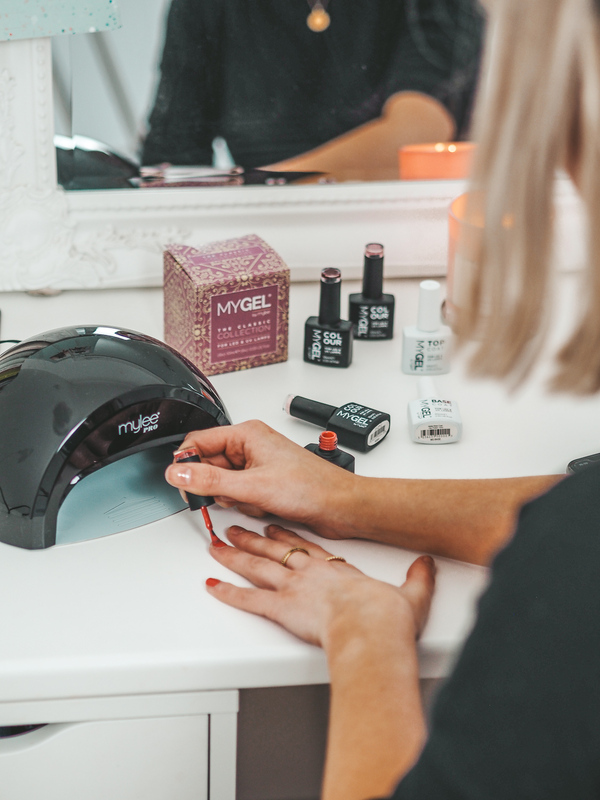 The Mylee gel kit has transformed my nail routine and has given me that excitement to have my nails painted once again. I can now get both hands done within half an hour, and don’t have to sit flapping my hands about for hours waiting for them to dry! I don’t think I’ll touch a normal polish again. Have you tried an at home gel nail kit?